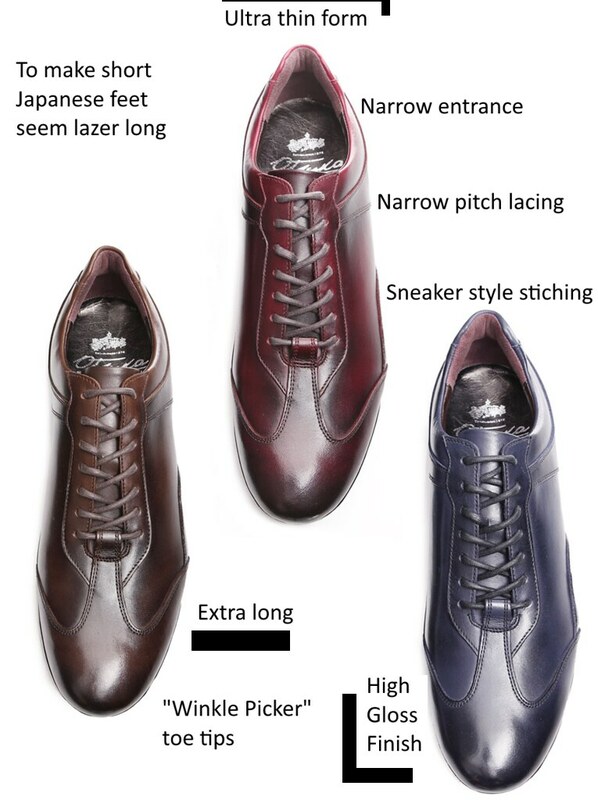 These Ostuka Lazer Sneakers are designed, I believe, to make Japanese feet - which are generally shorter than those of European descent - seem as long as a laser beam. They are long in the forefoot before the start of the laces and end in empty winkle picker toes. The laces, though they start higher on the foot, have a narrower pitch and also end higher on the foot to make it seem that the wearer is positively L shape. The whole shoe is as narrow as possible, in sporty sneaker style, but accentuates itself by the use of high gloss leather. These Japanese semi formal sneaker shoes are trying to tell us that their wearer has a body like a ballet dancer, with style, reserve, and finesse. The Japanese are masters at visual self-enhancement. When you next meet a self-deprecating Japanese man, look at his feet. You may also notice that he is standing in a Yohei pose to emphasize the thinness of one of this thighs.